2 Palestinian civilians were killed in occupied Jerusalem. 6 civilians were wounded in the Gaza Strip and West Bank. Israeli Forces Target the Border areas in the Gaza Strip. However, no casualties were reported. A house was partially destroyed in Nablus belonging to a person accused of preparing an attack, where two settlers were killed. Israeli forces conducted 49 incursions into Palestinian communities in the West Bank and 2 ones in the Gaza Strip. 122 civilians, including 32 children, were arrested. 50 of them, including 18 children were arrested in occupied Jerusalem. Israeli forces raided an orphan school, maltreated Abu Sbeih Family and closed their shops. 34 facilities were levelled in Kherbet Ras al-Ahmar, east of Tubas, displacing 46 persons, including 26 children. A 1-dunum land and agricultural room were levelled, south of Hebron. Settlers carried out many attacks against olive pickers and their property. Two fishermen, including a child, were arrested and their boats were confiscated. 10 Palestinian civilians were arrested at military checkpoints. Trader from Khan Younis was arrested at Beit Hanoun “Erez” Crossing in the northern Gaza Strip. Israeli violations of international law and international humanitarian law in the oPt continued during the reporting period (06 – 12 October 2016). Israeli forces have continued to commit crimes, inflicting civilian casualties. They have also continued to use excessive force against Palestinian civilians participating in peaceful protests in the West Bank and Gaza Strip, the majority of whom were youngsters. During the reporting period, Israeli forces killed 2 Palestinian civilians in Jerusalem and wounded 6 others in the Gaza Strip and West Bank. In the West Bank, on Sunday, 09 October 2016, Israeli forces opened fire at Mesbah Abu Sbeih (39) from Silwan after carrying out a shooting attack near “the Israeli Police Headquarter” in al-Sheikh Jarrah neighbourhood, north of East Jerusalem’s Old City. Israeli forces killed on 11 October 2016, ‘Ali Shyoukhi (20) and wounded another one with a metal bullet in his eye when they moved into ‘Ein al-Lozeh neighbourhood in Silwan village. Young men then gathered to throw stones and Israeli forces fired live bullets and rubber-coated metal bullets. As a result, Shyoukhi was wounded with a bullet to the pelvis and left bleeding for more than an hour and a half as Israeli forces denied PRCS ambulances access. On 07 October 2016, three Palestinian civilians were wounded when Israeli forces moved into al-Far’eah refugee camp, south of Tubas. in the Gaza Strip, on 07 October 2016, a Palestinian civilian was wounded to the right leg when Israeli forces stationed along the border fence , east of al-Shuja’iyah, east of Gaza City, opened fire at dozens of young men who headed to Nahal ‘Oz area, east of al-Shuja’iyah, to participate in activities in solidarity with Jerusalem. On the same day, a Palestinian civilian was wounded with a bullet to the left leg when Israeli forces stationed along the border fence, east of al-Bureij, opened fire and fired tear gas canisters at dozens of young men, who headed to the area, in solidarity with Jerusalem. A Part of targeting Palestinian fishermen in the Sea, on 07 October 2016, Israeli forces stationed offshore arrested two Palestinian fishermen sailing within 5 nautical miles off Gaza shore. They took the fishermen to Ashdod Seaport, where they were questioned. One of them was released while the other is so far under arrest. Their boat was confiscated. On 11 October, Israeli gunboats off al-Soudaniyah shore, west of Jabalia in the northern Gaza Strip opened fire at Palestinian fishing boats sailing within 3 nautical miles. The shooting recurred on 12 October 2016 as well. However, neither casualties nor damages to the boat were reported. In the context of targeting the border areas, on 06 October 2016, Israeli forces fired artillery shells at a military site belonging to Hamas, east of al-Maghazi in the Central Gaza Strip. However, no casualties were reported. On 09 October 2016, Israeli forces stationed along the border fence opened fire at farmers and their lands, east of al-Maghazi refugee camp in the central Gaza Strip. On 10 October 2016, Israeli forces stationed along the border fence opened fire at shepherds, east of al-Bureij in the central Gaza Strip. However, no casualties were reported, but farmers and shepherds were forced to flee for fear of being killed. On 11 October 2016, Israeli forces accompanied with military vehicles moved into Nablus, and stationed in the al-Shamaly Mount. They surrounded ‘Alawi building on al-Manjarah Street near Khadijah Mosque. An Israeli officer asked Salah ‘Alawi (56) to call the residents of the 8-storey building that sheltered 48 persons, including 25 children, and locked all of them in one room in the fourth floor. Ten minutes later, the Israeli officer called Salah and took him with other soldiers to an apartment belonging to his brother Amjad, who is still under the Israeli custody. While they were in the apartment, an Israeli officer showed Salah a paper written in Hebrew and read it for him. The paper was an administrative demolition notice issued by the Israeli High Court on 27 September 2016, to demolish Amjad’s house. It should be noted that Amjad was accused of established an ‘Izz al-Deen al-Qassam cell that is responsible for carrying out the “Itamar” settlement attack on 01 October 2016. Israeli forces also damaged the internal walls of Amjad’s 270-square-meter apartment inhabited by his wife and 7 children. The demolition continued till 04:25 and resulted in destroying all of the apartment internal walls. During the reporting period, Israeli forces conducted at least 49 military incursions into Palestinian communities in the West Bank. During these incursions, Israeli forces arrested at least 122 Palestinian civilians, including 32 children. Fifty of them, including 18 children, were arrested in occupied Jerusalem. In the Gaza Strip, Israeli forces conducted two limited incursions. On 06 October 2016, Israeli forces moved 100 meters into al-Shokah village, east of Rafah City in the southern Gaza Strip. On 10 October 2016, they moved 100 meters to the west of the border fence, east of al-Bureij. During this week, Israeli forces raided many times an orphan school in Jerusalem’s old City and chased students under the pretext of throwing bottles and stones at the Israeli soldiers at the entrance to al-Aqsa Mosque. They arrested 4 students when they were on their way out from school. Moreover, they threatened the School Administration and their teachers and students of raiding the school another time. In the context of settlers’ attacks, on Tuesday, 11 October 2016, dozens of settlers raided al-Aqsa Mosque in Jerusalem’s Old City under the protection of the Israeli Forces celebrating Yom Kippur. On 09 October 2016, Israeli forces backed up with four bulldozers and 12 military jeeps accompanied with officers from the Organization and Construction Department in the Civil Administration, moved into Kherbet al-Ras al-Ahmar, east of Tubas. Israeli forces demolished 43 facilities belonging to 9 families of 46 members, including 26 children. On 10 October 2016, Israeli forces demolished a 16-square-meter room in al-Deirat village, east of Yata, south of Hebron. This room used as a store for hand tools was built of bricks and tin plates and belongs to Mousa Mohammed Ibrahim al-‘Adrah. They also levelled a 1-dunum land belonging to Mohammed Mahmoud al-‘Adrah. In the same context, Israeli settlers carried out several attacks against Palestinian olive pickers. On 07 October 2016, a group of Israeli settlers attacked a number of Palestinian farmers from Yasouf village, east of Salfit while picking olives in al-Mahawer area, east of the aforementioned village. Palestinian lands of Qaryout village, east Nablus, attack the family of Saher Mousa (63) while picking olives from their land near the aforementioned settlement. In the West Bank, Israeli forces continued to suffocate the Palestinian cities and village by imposing military checkpoints around and/or between them. This created “cantons” isolated from each other that hinders the movement of civilians. Moreover, the Palestinian civilians suffering aggravated because of the annexation wall and checkpoints erected on daily basis to catch Palestinians. During the reporting period, Israeli forces arrested 5 Palestinian civilians, including a child, while passing through those checkpoints. At approximately 01:00, Israeli forces moved into ‘Aiyda refugee camp, north of Bethlehem. They raided and searched houses from which they arrested Mo’taz Ibrahim Musalam (14), Omar Ahmed Radi (14) and Mostafa Raied Bdair (14). At approximately 02:00, Israeli forces moved into Yatta village, south of Hebron, and stationed in al-Roq’a area. They raided and searched a house belonging to Odai ‘Isaa ‘Awad Makhamrah (18) and arrested him. Around the same time, Israeli forces moved into al-Dahyisha refugee camp, south of Bethlehem. They raided and searched houses and then arrested Basil Ibrahim Mizher (23). At approximately 03:00, Israeli forces moved into Nour al-Shams camp, east of Tulkarm. They raided and searched houses from which they arrested Murad Nawaf Sawalha (19), Mohamed Ibrahim Hamarsha (18), Nasir Jihad al-Jundi (19), Mahmoud Riyad Jaber (24), and Mohamed Riyad Jaber (18). Around the same time, Israeli forces moved into al-Far’a refugee camp, south of Tubas. They surrounded a house belonging to Thaer Abdullah ‘Odah (21) in Zaydan neighborhood in the center of the village and ordered him via loudspeakers to surrender. After he surrendered, Israeli forces raided and searched the house. At approximately 04:00, Israeli forces withdrew and took Thaer to an unknown destination. Around the same time, Israeli forces moved into Samou’a village, south of Hebron. They raided and searched a house belonging to ‘Abed al-Rahman ‘Isaa Abu ‘Awaad (26) and arrested him. At approximately 03:30, Israeli forces moved into Dura al-Qari’ village, north of Ramallah. They raided and searched houses from which they arrested Jihad Anwar Mo’amar (27); his brother Nadeem (22); Ihsan Monther Foqah (25); Mohamed ‘Esam Rifa’y (22); and Mohamed Basam Hasan (22). At approximately 08:30, Israeli forces accompanied with military vehicles and bulldozers moved about 100 meters into Sofa military site in al-Shawka village, east of Rafah, south of the Gaza Strip. Israeli vehicles leveled lands and placed sand barriers in the area. They later re-deployed along the border fence. In the morning, Israeli forces arrested Shifa ‘Awad Mahmoud Abu Farijah (20), from Artas village, south of Bethlehem after summoning her for investigation in “Gosh Etzion” settlement, south of the city. Shifa’s father said that Israeli forces called him and ordered him to bring his daughter for investigation. Shifa headed to “Gosh Etizion” settlement, along with her father and cousin. Israeli forces investigated with her for few hours, while her family was waiting outside. An Israeli soldier got out and told her family that Shifa was arrested as she has been wanted for two years for security reasons. Abu Farija added that a week ago the Israeli Intelligence Service sent a summons to her daughter to refer to the Israeli Intelligence Service in “Ghosh Etzion” settlement, so she went along with her brother Mohamed (23), but was questioned. It should be noted that, Israeli forces confiscated Mohamed’s ID. At approximately 15:00, Israeli artillery fired at least a shell at a military checkpoint belonging to Hamas Movement, east of al-Maghazi camp, in the center of the Gaza Strip. No casualties were reported. Note: During the aforementioned day, Israeli forces conducted (4) incursions in the following areas and no arrests were reported: Jayyous and Sair villages, northeast of Qalqiliya; and Beit Ola and Tafouh villages in Hebron. At approximately 01:00, Israeli forces moved into Sabastiya village, northwest of Nablus. They raided and searched houses from which they arrested Mohamed Nour al-Deen Mokhaymer (31) and Yazan Ahmed Kayid (22). At approximately 02:00, Israeli forces moved into Nour al-Shams refugee camp, east of Tulkarm. They raided and searched houses from which they arrested Saif Hanafy Abu Libdah (26), Basem Abed al-Raheem Shawish (30) and Waleed ‘Esam ‘Asfour (23). At approximately 03:00, Israeli forces moved into al-Far’a refugee camp, south of Tubas and patrolled the area. After that, a number of Palestinian young men gathered and threw stones and empty bottles at Israeli soldiers, who fired live bullets and rubber-coated metal bullets at them. As a result, 3 civilians sustained shrapnel wounds. The first one (19) was hit with a live bullet to the right hand; the second one (21) sustained shrapnel wounds to the shoulder; the third one (26) sustained shrapnel wounds to the leg. The wounded persons were then taken by a PRCS ambulance to Turkish Tubas Hospital, where medical sources classified their wounds as moderate and minor. During the incursion, they arrested Mostafa Hussain Subieh (21) and Basam Basem Shawish (25) and took both of them to an unknown destination. PCHR keeps the names of the wounded persons. At approximately 06:00, Israeli forces stationed offshore arrested two fishermen while sailing within 5 nautical miles. Mohamed ‘Awaad al-Sa’idy (17), one of the two arrested, said to PCHR’s fieldworker that at approximately 04:00, he headed to Gaza Seaport to meet his cousin Mahmoud al-Sa’idy and then went for sailing by a fishing boat belonging to Riyad Abed al-Kareem al-Shrafi. After that, Israeli gunboats suddenly approached and ordered them to take off their clothes, jump into the sea and swim towards the gunboats. The fishermen were handcuffed and blindfolded and then taken to Ashdod Seaport. Israeli navy forces locked them in a closed room and asked them about their personal data and some persons. At approximately 15:00, Israeli forces released Mohamed via Beit Hanoun “Erez” crossing, while Mahmoud al-Sa’idy is so far under the Israeli custody and the fishing boat as well. Note: During the aforementioned day, Israeli forces conducted (7) incursions in the following areas and no arrests were reported: Dura, Samou’a, Kharsa, Suraa and Muthalath al-‘Aqabah villages in Hebron; and Kaful Hares and Hares villages, north of Salfit. Note: During the aforementioned day, Israeli forces conducted (4) incursions in the following areas and no arrests were reported: al-Dahiriya, al-Moreq and Yatta villages in Hebron and the southern area of Hebron. At approximately 01:50, Israeli forces moved into Qabatia village, south of Jenin. They raided and searched houses and then arrested Salah al-Deen Najeh Mohamed Kmail (23), who is a former prisoner in the Israeli jails. Around the same time, Israeli forces moved into Qarawet Bani Hassan village, northwest of Salfit. They raided and searched houses from which they arrested Ali Abdullah Moahmed ‘Asi (23) and Mohamed Mahfouz Haroun Mar’I (20). At approximately 02:00, Israeli forces moved into ‘Awourah village, northwest of Ramallah. They raided and searched a house belonging to Thaer ‘Awad Saleh (35) and arrested him. It should be noted that Thaer served 6 years in the Israeli jails. Around the same time, Israeli forces moved into Nahalin village, west of Bethlehem. They raided and searched a house belonging to Mohamed ‘Ezat Shakarnah and arrested his two sons Nour al-Deen (21) and Bahaa al-Deen (17); and his nephew Ahmed Waleed ‘Ezat Shakarnah (19). At approximately 04:00, Israeli forces moved into Nablus, and stationed in Khilat al-‘Amoud neighborhood. They arrested Iyad ‘Alaa al-Nabulsy (19) and then withdrew. It should be noted that Eyad is an activist of the Popular Front for the Liberation of Palestine (PFLP). 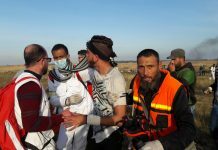 At approximately 17:00, Israeli forces stationed along the border fence between the Gaza Strip and Israel, opened fire at farmers and their agricultural fields, east of al-Maghazi camp, in the centre of the Gaza Strip. The farmers were forced to flee for fear of being wounded and no casualties were reported. At approximately 01:00, Israeli forces accompanied with 8 military vehicles moved into ‘Azoun village, east of Qaqilyia. They raided and searched 7 houses and 3 workshops. They damaged the workshops’ contents and confiscated tools from Nizar’s workshop. They then shut it down and sealed it with red wax. The workshops belong to Hamadallah Fares Redwan, Ja’far Osama Badran and Nizar Suliman ‘Odah. They also arrested Kathem Mofeed Ridwan (24); Ali Fareed Hussain (20); Monther Yasir Salama Saleem (18); Qsai Shaher Saleem (21); Mahmoud Jamal ‘Odah (19); Mohamed Abed al-Kareem Saleem (25); ‘Esam Rasheed Ridwan (26) and Nizar Suliman ‘Odah (38). Around the same time, Israeli forces moved into Beit Ummer village, north of Hebron, and stationed in al-‘Asidah area. They raided and searched a house belonging to Mohamed Na’iem Abu Mariya and arrested his sons ‘Alaa (22) and ‘Odai (24). At approximately 02:00, Israeli forces accompanied with 4 vehicles moved into Yatta village, south of Hebron, and stationed in al-Jilah area. They raided and searched a house belonging to Naief Abed al-Kareem Zain and arrested his two sons Anwar (26) and ‘Abed al-Kareem (23). At approximately 03:00, Israeli forces moved into Tulkarm refugee camp, east of Tulkarm. They raided and searched houses and then arrested Ameer Salah Omar ‘Emarah (19). At approximately 07:00, Israeli forces accompanied with 5 vehicles moved about 100 meters to the west of the border fence between Gaza Strip and Israel, east of al-Burij refugee camp, in the centre of the Gaza Strip. Israeli vehicles patrolled the area levelled lands. The incursion continued till 12:00 before re-deploying along the fence. At approximately 16:45, an Israeli undercover unit wearing civil clothes moved into Hares village, northwest of Salfit, with a private car. Suddenly, they stepped out of the car and arrested 5 civilians, while they were near a market in the centre of the village. The arrested persons were identified as Bashar Mohamed Sultan (40); ‘Alaa Basam Sultan (22); Husam Subhi Jaber (38); Hussni Husam ‘Aqil (16) and Mokafeh Abed al-Raheem Kulaib (18). Three of the arrested persons were later released, while Husam Subhi Jaber and Bashar Mohamed Sultan are so far under the Israeli custody. At approximately 17:00, Israeli forces stationed along the border fence between the Gaza Strip and Israel, opened fire at shepherds, east of al-Burij refugee camp, in the centre of the Gaza Strip. Israeli vehicles patrolled the area and levelled lands. The incursion continued till 12:00, before redeploying along the border fence. At approximately 18:00, a special force of Israeli soldiers moved into ‘Ayida refugee camp, north of Bethlehem, under the Israeli forces protection. They stationed near the camp cemetery. After that, Israeli soldiers raided and searched houses, during which, dozens of Palestinian civilians gathered and threw stones and empty bottles at them. Israeli soldiers then fired live bullets and rubber-coated metal bullets at the protesters and chased them. Moreover, they arrested 10 civilians, including 8 persons, and took them to an unknown destination. PCHR keeps the names of the arrested persons. Note: During the aforementioned day, Israeli forces conducted (4) incursions in the following areas and no arrests were reported: Sa’ir, Ethna and al-Hadab villages and al-‘Aroub refugee camp in Hebron. At approximately 02:00, Israeli forces moved into Jenin and its camp. They raided and searched houses from which they arrested ‘Abed al-Salam Jamal Abu al-Haijaa (31), Yehia Basam al-Sa’di (20) and Mohamed Mo’tasim al-Sabagh (22). At approximately 02:15, Israeli forces moved into Qabatia village, south of Jenin. They raided and searched houses. At approximately 03:00, they arrested Thamir Abed al-Ghani Faieq Sana’nah (40). At approximately 03:00, Israeli forces moved into al-Jabie’ village, south of Jenin. They raided and searched houses. At approximately 03:45, they arrested Ahmed Saleem Ahmed Salatnah (54). At approximately 03:30, Israeli forces moved into Tulkarm and Katabah suburb, east of the city. They raided and searched houses from which they arrested Seif al-Deen Samer al-Edrisy (25) and Mohamed ‘Izaat Jabir (33) and took both of them to an unknown destination. At approximately 05:30, Israeli gunboats stationed off al-Sudaniya shore, west of Jabalia refugee camp, north of the Gaza Strip, opened fire at Palestinian fishing boats sailing within 3 nautical miles. As a result, fishermen were forced to flee for fear of being arrested or wounded. No casualties were reported. At approximately 21:30, Israeli forces moved into Ni’lin village, west of Ramallah, and stationed in the centre of the village. Dozens of Palestinian civilians gathered and threw stones and empty bottles at Israeli soldiers, who fired live bullets and rubber-coated metal bullets at them. At approximately 00:00, Israeli forces damaged civilians’ vehicles on the main street, closed the village’s western and eastern entrances and later withdrew. Note: During the aforementioned day, Israeli forces conducted (3) incursions in the following areas and no arrests were reported: Hahoul and Hadb al-‘Alqah villages in Hebron; and Hawarah village, south of Nablus. At approximately 04:00, Israeli forces moved into Ni’lin village, west of Ramallah, and stationed in the centre of the village. They raided and searched houses from which they arrested Hamza Hazem Abed al-Fatah Khawaja (25), Mo’taz Salah Mohamed Khawajah (16), Barakat Ali Nafie’ (35) and Zuhadi Fawzi Ali Nafei’ (22). Following the Friday prayer, 07 October 2016, Palestinian civilians and Israeli and international human rights defenders organized protests in Bil’in and Ni’lin villages, west of Ramallah; al-Nabi Saleh village, northwest of the city and Kufor Qaddoum village, northeast of Qalqiliya. Israeli forces forcibly dispersed the protests, firing live and rubber-coated metal bullets, tear gas canisters and sound bombs. They also chased the protesters into olive fields and houses. As a result, some of the protesters suffered tear gas inhalation while others sustained bruises as Israeli soldiers beat them up. Eyewitnesses said to PCHR’s fieldworker, at approximately 16:00, during the demonstration in Bil’in village, Israeli forces attacked Mohamed al-Khatib (45), while he was attempting to access his agricultural field that was declared as a closed military zone by Israeli forces. They also confiscated his vehicle. At approximately 14:00 on Friday, 07 October 2016, Israeli forces stationed at the border fence between the Gaza Strip and Israel, east of al-Shuja’iya, east of Gaza City, fired live bullets and rubber-coated metal bullets at Palestinian young men, while they were on their way to Nahal ‘Oz area, east of al-Shuja’iya participating in activities held in solidarity with Jerusalem. The activities continued until 18:00. As a result, ‘Abed al-Salam Na’iem Abed al-Rahman al-‘Ejlah (25), was hit with a live bullet to the right leg that resulted in cutting his tendons. Abed al-Salam was taken by an ambulance to al-Shifa Hospital, where he underwent a surgery and medical sources classified his wound as moderate. Around the same time, dozens of Palestinian young men headed to the border fence between the Gaza Strip and Israel, south of al-Burij refugee camp, to Support Jerusalem. They threw stones at the Israeli soldiers, who fired live bullets and teargas canisters at them. As a result, Yousef Mohamed Ibrahim Abu Rahma (20) sustained a superficial bullet wounds to the left leg. He was then taken to al-Aqsa Hospital, where medical sources classified his wounds as moderate. At approximately 00:25 on Tuesday, 11 October 2016, Israeli forces accompanied with military vehicles moved into Nablus, and stationed in al-Shamaly They surrounded ‘Alawi building on al-Manjarah Street near Khadijah Mosque. An Israeli officer asked Salah ‘Adel Ahamed ‘Aleiwi (56) to call the residents of the 8-storey building that shelters 48 persons, including 25 children, and locked all of them in one room in the fourth floor. Ten minutes later, the Israeli officer called Salah and took him with other soldiers to an apartment belonging to his brother Amjad, who is a prisoner in the Israeli jails. While they were in the apartment, an Israeli officer showed Salah a paper written in Hebrew and read it for him. The paper was an administrative demolition notice issued by the Israeli High Court on 27 September 2016, to demolish Amjad’s house. It should be noted that Amjad was accused of establishing an ‘Izz al-Deen al-Qassam cell that is responsible for carrying out “Itamar” settlement operation on 01 October 2016. Salah was photographed while he holding the notice and other notice was pinned to Amjad’s apartment door. Israeli forces also damaged the internal walls of Amjad’s 270-square-meter apartment inhabited by his wife and 7 children. The demolition continued till 04:25 and resulted in destroying all of the apartment internal walls. PCHR apologizes for not publishing the Karm Abu Salem crossing table this week and will publish it next week because the data was not prepared by the competent bodies at the Ministry of Economy and Petroleum Department. It will be published next week. On Friday, 07 October 2016, Israeli forces allowed 229 persons from the Gaza Strip to perform prayers in al-Aqsa Mosque in Jerusalem. On Thursday, 06 October 2016, Israeli forces allowed 3 persons working in the Civil Affairs Department to attend a meeting at the crossing. On the same day, Israeli forces allowed 3 persons working in international organizations to renew their permits. On Tuesday, 11 October 2016, Israeli forces closed the crossing due to the Jewish holidays. On Thursday, 06 October 2016, Israeli forces arrested ‘Atef Mohammed Salim al-Dabas (53), who is a trader and owns a supermarket, from al-Qararah village, east of Khan Yonis, south of the Gaza Strip. The Israeli intelligence service summoned him to refer to Beit Hanoun (Erez) crossing. ‘Atef’s son Rami said to PCHR’s fieldworker that at approximately 08:00, his father went to Beit Hanoun (Erez) crossing to refer to the intelligence service to obtain a permit for passing via the crossing. At approximately 17:00 the next day, Rami received a call from a person who introduced himself as a lawyer, informing Rami that the Israeli forces detained his father. On Thursday, 06 October 2016, Israeli forces established 3 checkpoints at the entrances to Kharas, al-Thaheriyah and Bani Na’im villages. On Friday, 07 October 2016, Israeli forces established 2 checkpoints on the road of Tarusah village, west of Dora, and at the southern entrance to Hebron (al-Fahes). On Saturday, 08 October 2016, Israeli forces established 4 checkpoints at the entrances to Beit Oula and Beit ‘Awa villages and Abu Reshah Road, west of Ethnah. On Monday, 10 October 2016, Israeli forces established 4 checkpoints at the eastern entrance to Dora, the northern entrance to Yatta, al-Fawar refugee camp and Kharsah village. On Tuesday, 11 October 2016, Israeli forces established 4 checkpoints at the entrances to al-‘Aroub refugee camp, Beit Ommar, al-Karmel villages and Farsh al-Hawa Road, west of Hebron. At approximately 13:00 on Tuesday, 11 October 2016, Israeli forces established a checkpoint at the entrance to Um Safa village, northwest of Ramallah. The soldiers searched the cars entering and leaving the village causing traffic jam. At approximately 15:00, they removed the checkpoint, and no arrests were reported. In the meantime, Israeli forces established a similar checkpoint at the main entrance to Deir Netham village, west of the city. At approximately 19:00 on Sunday, 09 October 2016, Israeli forces established a checkpoint near Zabubah village, west of Jenin. They searched cars, checked the passengers’ ID cards and prevented civilians from entering or leaving the village. At approximately 16:00 on Thursday, 06 October 2016, Israeli forces arrested Mahmud Jawad Zama’rah (26) from Halhoul, north of Hebron. They stopped the car in which he was at a checkpoint established at the southern entrance to the city and arrested him. It should be noted that Mahmud works in the Palestinian Civil Defense. At approximately 04:00 on Saturday, 08 October 2016, Israeli forces stationed at the Container checkpoint, east of Bethlehem, arrested 5 civilians from al-Dawhah village, west of the city. The arrested civilians were identified as Ezat Husain Masalmah (27), Fares Rasmi ‘Amar (34), Mohammed Fawzi Masalmah (21), Obaidah Amjad Bujah (21) and Mahmud ‘Atef ‘Amar (20). At approximately 15:00 on Sunday, 09 October 2016, Israeli forces stationed at the entrance to Salem Military Court, west of Jenin, arrested Tawfiq Mohammed al-Shalabi (20) while visiting a friend at the court. At approximately 15:30, Israeli forces established a checkpoint near Mashah village, west of Salfit. They searched the cars and checked civilians’ ID cards. At approximately 16:30, the Israeli forces arrested Mohammed Jehad Mohammed Ali Rabai’ah (23) from Maithaloun village, south of Jenin, when passing through the abovementioed checkpoint in his car. At approximately 18:30, Israeli forces stationed at Hawarah checkpoint, south of Nablus, closed the checkpoint and stopped 5 cars of the parade celebrating the release of former prisoner Ahmed Oudah from Hawarah village, south of the city. There were 11 civilians from the abovementioned village inside those cars. The Israeli forces detained them for an hour. Moreover, they found fireworks inside one of the cars, so they arrested Majed Mohammed Ali Sa’adah (25) and his cousin Elyas Nour Edin Ali Sa’adah (27) claiming that they launched fireworks at settlers inside Hawarah village. On Sunday, 09 October 2016, Israeli police officers and Special Forces opened fire at a Palestinian civilian after he carried out a drive-by shooting attack near the “Israeli Police Headquarter” in Sheikh Jarrah neighbourhood, north of the Old City in East Jerusalem. As a result, the civilian sustained several live bullet wounds and died on the spot. According to investigations conducted by PCHR’s fieldworker and statements of eyewitnesses, at approximately 10:00, Mesbah Sbaih Abu Sbaih (39) from Silwan village drove his car from the French Hill Road near the light rail station near the “Israeli Police Headquarters” in Sheikh Jarrah neighbourhood. Mesbah fired from a machine gun and wounded an Israeli female settler (60). Abu Sbaih continued to drive towards the Clermon Crossroad near the “Israeli Police Headquarters” and opened fire at an Israeli female settler, who was crossing the road in her car. As a result, she was seriously wounded. After that, Mesbah stopped his car at the intersection of Sheikh Jarrah. Shooting erupted between the special forces, who arrived at the scene, and Mesbah. As a result, a police officer sustained critical wounds while another sustained a minor one. In the meantime, Israeli border guards arrived at the scene and shot him dead. Later, the Israeli police said in a statement that an Israeli police officer (30) and a settler (60) were killed while 6 others were wounded, one of whom sustained serious wounds. Abu Sbaih was supposed to turn himself in on the abovementioned day morning to al-Ramlah prison to serve a 4-month sentence for “attacking a police officer in Jerusalem’s Old City”. It should be noted that he was a former prisoner, who served 39 months in the Israeli prison in addition to detaining him in different investigation centres for “defending al-Aqsa mosque”. Mesbah was released in the end of December 2015 after he served 12 months in prison on charges of “incitement on Facebook” after he wrote: “with soul and blood, we shall redeem al-Aqsa mosque”. A month ago, the Israeli Magistrate Court sentenced him to serve 4 months in actual prison after attacking a police officer in Jerusalem’s Old City in 2013. After Mesbah was released, he was surprised that the Israeli police reopened the case. According to the decision, he was supposed to turn himself in in the middle of this October, but the Intelligence Services ordered him to turn himself in on Sunday, 01 October 2016 or he will be transferred to the administrative detention. At approximately 20:00 on Thursday, 11 October 2016, Israeli forces moved into Ein al-Lawzah neighbourhood in Silwan village, south of the Old City in East Jerusalem. They deployed in the neighbourhood alleys and then raided and searched 6 houses belonging to al-Abasi family. They broke the doors and attacked and beat the inhabitants. In the meantime, dozens of Palestinians gathered from all the village neighbourhoods and threw stones and Molotov cocktails at a military jeep which was in the area and caught fire. As a result, the Israeli soldiers randomly fired live bullets, rubber-coated metal bullets and tear gas canisters. They then closed the streets and roads in the neighbourhood, isolated it from the other neighbourhoods and chased the young men, who were able to flee. Clashes reached Maraghah and Beir Ayoub neighbourhoods. At approximately 10:00, the clashes erupted in Ein al-Lawzah neighbourhood between Palestinians and the Israeli soldiers, who fired live bullets at them in response. As a result, a young man was hit with a metal bullet to his right eye and received medical treatment on the spot. Moreover, Ali ‘Atef Ibrahim Shayoukhi (20) was hit with a live bullet to his pelvis. Ali left to bleed for more than an hour and a half as the Israeli forces prevented crews of the PRCS from offering Ali first aid. Following this, a number of the neighbourhood’s residents were able to take him to a hospital, but he succumbed at approximately 23:40 to his wounds. After midnight, hundreds of the village inhabitants participated in Ali’s funeral procession to prevent the Israeli forces from detaining his body and buried him in al-Sawahrah cemetery after short time of his death. It should be mentioned that Ali was a former prisoner as he was arrested several times. He was arrested for the first time with his twin brother Mohammed when they were 12 years old while the last arrest was on 08 October 2016 as Ali was sentenced to serve 15 months in prison and was released at the end of the last year. At approximately 02:00 on Thursday, 06 October 2016, Israeli forces moved into al-Isawiyah village, northeast of East Jerusalem. They raided and searched several houses in the village and then arrested 11 civilians, including 4 children. (PCHR keeps the names of the arrested civilians). At approximately 03:00, Israeli forces moved into al-Tur neighbourhood, east of Jerusalem. They raided and searched a number of houses. They then arrested 4 civilians, including 3 children, namely: Ahmed Marwan Abu Jom’ah (16), Ibrahim Mohammed Abu al-Hawa (15), Wajih Amin Sbaitan (19) and Riyad Mohammed Karawi (15). On Sunday, 09 October 2016, following the announcement of Mesbah Abu Sbaih’s death, Israeli police and intelligence services raided the house of his family in al-Fuqa neighbourhood in Silwan village and his family’s and brothers’ house in al-Ram village, north of Jerusalem. They arrested his son, Ezz al-Deen, his elderly father and two brothers Mo’amer and Nabih for investigation. They then raided and searched several houses belonging to Abu Sbaih family in al-Ram village and Kafer ‘Aqab neighbourhood, north of the city. Abu Sbaih family said to PCHR’s fieldworker that Israeli forces raided a two-storey building comprised of 4 apartments belonging to Suboh Abu Sbaih in al-Ram village. In the meantime, Israeli forces raided Abu Sbaih’s house and his brother’s in Kafer ‘Aqab village (in the seventh floor of a residential building). The family added that Israeli forces searched all apartments in his father’s building, locked the women in one room and men in another, prevented them from moving or speaking and stationed on the house roof. They also searched a car belonging to the family and removed all posters and flags raised on the building walls. The family mentioned that Israeli soldiers detained Mesbah’s wife and daughter Eman (17) alone as they interrogated them about their place of living and why they were present in al-Ram not in Kafer ‘Aqab in addition to other questions. After an hour of investigation, the Israeli soldiers arrested Eman. They then took measurements of an apartment where Mesbah’s parents live. They also ordered Mesbah’s sons, Ezz and Sbaih, to refer to the intelligence services for interrogation again and threatened them of raiding the house again if Ezz and Sbaih did not come. In Kafer ‘Aqab’s neighbourhood, Israeli forces raided and searched 2 houses belonging to Mesbah and his brother Jaber, but none was home. They ruined the houses’ contents, took measurements of them, checked the walls and made holes in them. Mofeed al-Haj, lawyer at the Palestinian Prisoners Club, said that Israeli forces carried out a wide-scale arrest campaign; during which, 5 civilians, between 18 and 23 year old, were arrested. They interrogated them about recording the shooting at Mesbah in Sheikh Jarrah neighbourhood in Jerusalem as the video was published on social media. The arrested civilians were identified as Ibrahim Suleiman Sanduqah and his brother Moatz, Ramzi Mohammed al-Jo’abah, Mohammed Hani Muhalwes and Mustafa Owaidah all of them were detained to the next day. The lawyer added that Israeli forces arrested Sharif Taha (36) and Samer Abu Qadous (39) from the Old City, interrogated them about closing their shops in the city and extended their arrest. The lawyer also mentioned that the intelligence services summoned him for interrogation and arrested Naser Qaws (45), Director of the Prisoners’ Club, and Nehad Zuhgair accusing them of “planning for a criminal act”. The Israeli forces continued its wide-scale arrest campaign in Jerusalem on charges of “supporting Abu Sbaih’s attack”. Moreover, the Israeli police said in a statement that the “Minister of Internal Security” instructed the police to “use all legal procedures against any activity that supports the shooting attack”. Furthermore, they arrested 17 civilians, including 6 children. (PCHR keeps the names of the arrested civilians). On Thursday early dawn, 11 October 2016, Israeli forces closed commercial shops belonging to Mesbah Abu Sbaih in al-Ram village, north of east Jerusalem following a decision issued by “the Israeli Military Commander Roni Numah”. The family of Abu Sbaih said to PCHR’s fieldworker that Israeli forces raided and closed Abu Sbaih Sweets Shop and stores that are located in a building belonging to Mesbah in al-Ram village. The Orders regarding “closing a place” were hung on the doors of the stores according to Article 319 on the closure of places and according to the 1948 Emergency Laws. The orders explained that it was necessary to take this action to impose public order and for the safety of security forces. The family confirmed that the whole building is owned by Sbeih Abu Sbeih and is not owned by the attacker as the military order said. The family also explained that the Israeli forces raided all the apartments for the second consecutive day and searched and damaged their contents. They also locked all the residents (all of them were women) in one room in a provocative way and at gunpoint. They were prevented from talking or moving during the raid operation. The Israeli forces also took the measurements of the whole building from the inside and also took pictures of the inside and outside in addition to threatening to demolish the building and suspending their residency. The Israeli forces summoned Sbeih Abu Sbeih and his brothers, Tayseer, Ala’ and Jaber and his sons, Izz (18) and Mohammad (14), for interrogation amidst threats to raid the house again and carryout arrests. The Israeli forces also raided the houses of Musbah and his brother Jaber in the neighborhood of Kufor Aqab after blowing up the front doors. At approximately 10:00, Israeli forces arrested Samir Jebril, director of education in Jerusalem, and summoned Mohammed al-Atrash, director of Orphans’ School in the Old City in Jerusalem, to refer to al-Mascobiya police centre for interrogation and then issued a decision to deny him access to the Old City for 45 days. Samir Jebril said to PCHR’s fieldworker that Israeli forces came to the directorate, which is a building to which the Orphans School is attached, took him to al-Wad police station and detained him for an hour. They held him responsible for students throwing stones and bottles at the Israeli soldiers. Moreover, they held him legally-criminally and financially accountable in case stones were thrown again from the school. Israeli forces also threatened to close the school for a month if the attack was repeated. Samir Jebril denied that students threw stones or any other materials on the Israeli forces and explained:” It is impossible to do that especially because it is difficult to throw anything through the windows guard. In addition, the school doors are far away from al-Aqsa mosque”. He also confirmed that the roofs in the Old City are all connected with each other. He mentioned that in the afternoon, the police members came to the school and checked the classes and windows. He said that the Israeli forces raided the school on Monday, 12 October 2016 twice, which caused disorder in the school in the last two days. Mohammed al-Atrash, Director of the Orphans School, said to PCHR’s fieldworker that Israeli intelligence services summoned him to refer to al-Mascobiya police station for interrogation. They accused him of obstructing the police work and attacking an officer during the raid on the school the previous day. They also handed him a decision to deny him access to the Old City for 45 days. It should be mentioned that Israeli forces raided the Orphans’ school on Monday, 10 October 2016, and Thursday, 11 October 2016. They chased students and searched them under the pretext of throwing stones and bottles at soldiers stationed in al-Aqsa mosque. They then arrested 4 students immediately after they left the school. The arrested civilians were identified as Abdul Rahman Abu Anjib (15), Abdul Rahman Hafiz Jubran (16), Mahmud Eid (16) and Jebril Balawalah (17). They also threatened the school administration, teachers and students to bring military brigades and raid the school if anything else was thrown out of the school. On Thursday, 11 October 2016, dozens of Israeli settlers accompanied by the Israeli forces raided al-Aqsa mosque in the Old City in east Jerusalem in celebration of Yom Kippur Jewish holiday. The Islamic Endowments (Waqf) Department in Jerusalem said to PCHR’s fieldworker that around 184 settlers accompanied by the Israeli forces, police and intelligence officers raided the mosque and deployed in its yards. Eyewitnesses said that settlers raided the mosque in groups and performed their religious rituals. The police officers were also stationed since early morning and took the Palestinian worshipers’ ID cards and prevented other young men from entering the mosque. Family of Mohammed Fahed Mohammed Bani Oudah comprised of 7 members, including 5 children. Israeli forces demolished a 60-square-meter residential tent, 50-square-meter residential tent, 60-square-meter residential barrack made of tin plates, 4 sheep barns, a solar cell, 2 water tank, 30-square-meter kitchen, an oven and 2 feeding equipment. Family of Fayad Khader Bani Ouda comprised of 7 members, including 3 children. Israeli forces demolished a 20-square-meter residential tent, 40-square-meter storing tent, mobile bathroom, an oven, 20-square-meter tent used for raising pigeons, 60-square-meter sheep tent, 100-square-meter sheep barn and 80-square-meter storing tent. Family of Saed Yusuf Ahmed Basharat comprised of 10 members, including 8 children. Israeli forces demolished 3 residential tents of around 60 square meters, 60-square-meter sheep tent, 20-square-meter tent used for pigeons, 30-square-meter kitchen, bathroom and an oven. Family of Ali Ezat Yusuf Bani Oudah comprised of 7 members, including 4 children. Israeli forces demolished a 60-square-meter residential tent, 60-square-meter sheep tent, 150-square-meter sheep barn and 20-square-meter storing tent. Family of Mohammed Khader Fiad Bani Oudah comprised of 7 members, including 4 children. Israeli forces demolished a 60-square-meter residential tent, 40-square-meter storing tent, a mobile bathroom, an oven and 60-square-meter tent used for pigeons. Family of ‘Aref Jaber Tubasi comprised of 2 members. Israeli forces demolished a 60-square-meter residential tent, 80-square-meter sheep tent and 140-square-meter sheep barn. Family of Abdullah Husain Basharat comprised of 4 members, including 2 children. Israeli forces demolished a 60-square-meter residential tent. Israeli forces demolished a 100-square-meter sheep barrack belonging to Abdullah Husain Basharat. At approximately 09:00, on the same day, Israeli forces accompanied with a military jeep and a Civil Administration car moved into al-Derat village, east of Yatta, south of Hebron. They stationed at al-Haiyah area and handed Mahmud Ahmed Ibrahim al-‘Adrah (22) a notice to halt the construction works in his under construction house. The house is around 100 square meters in which Ahmed, his wife and their kids live. The notification no. (202084) that read, “Notice to halt construction works” was under the pretext of building without a license. A Secession was set on 31 October 2016 for the inspection committee in its head office in “Beit Eil” settlement, northeast of Ramallah. At approximately 01:15 on Thursday, 06 October 2016, Israeli settlers raided Balate al-Balad area, east of Nablus to perform their Talmudic prayers in “Joseph’s Tomb” on their Jewish holidays. In the meantime, Israeli forces accompanied with several military jeeps moved into the city and stationed in the eastern side of the abovementioned area, in the vicinity of the central market and al-Zayout Street in order to protect the settlers. In the morning, Israeli forces and settlers withdrew from the city. At approximately, 11:30 on Friday, 07 October 2016, dozens of Israeli settlers raided Ta’nak village, west of Jenin, to perform their Talmudic prayers on the mountains of the village. In the meantime, Israeli forces accompanied with several military jeeps moved into the abovementioned village and closed the main street to protect settlers. Later, the Israeli forces and settlers withdrew. At approximately 17:00, a group of settlers from “Kfar Tafouh” settlement attacked a number of Palestinian farmers from Yasuf village, east of Salfit, when they were harvesting olive in al-Mahawer area, east of the abovementioned village. The settlers sneaked into the area and threw stones on the farmers. After that, Israeli soldiers intervened after the settlers claimed that the farmers threw stones at them and arrested 2 Palestinian civilians. The arrested civilians were identified as Ahmed Radi ‘Atyani (26) and Abdul Adel Radi ‘Atyani (22). At approximately 00:00, Israeli forces released the two civilians. At approximately 01:30 on Monday, 10 October 2016, dozens of Israeli settlers raided Balata area, east of Nablus, to perform their Talmudic prayers in “Joseph’s Tomb” on their Jewish holidays. In the meantime, Israeli forces accompanied with several military jeeps were stationed in the eastern side of the area to protect the settlers. A number of Palestinians gathered and threw empty bottles at the Israeli soldiers, who patrolled in ‘Aman and al-Quds streets and the north-eastern entrance to Baltah refugee camp. In the early morning, Israeli forces and settlers withdrew from the area. Neither arrests nor injuries were reported. Between 09:15 and 09:30 on Monday, 10 October 2016, a settler known for his attacks on Palestinian civilians, came from “Eli” settlement established on the lands of Qaryout village, southeast of Nablus, attacked the family of Saher Mousa Yusuf Mousa (63) when they were harvesting olives from their land near the abovementioned settlement. The settler forced the family to leave the land, smashed the windows of Mousa’s car and damaged the 4 wheels using a knife. “Between 09:15 and 09:30 on Monday, 10 October 2016, I was present in my land in the south-western side of Qaryout village, southeast of Nablus, near “Eli” settlement. My sister Seta (65), son Mohammed (18) and I were harvesting olives in my land when a settler named came nearby and asked me to leave the place immediately. We went to the south while he went to the east where my car was. I did not expect him to cause damage to my car’s windows and wheels using a knife. Before I arrived, I heard the settler smashing my car windows. I walked towards him, but he continued damaging the car and fled to the abovementioned settlement before I approached him”.